and 73 teachers. Students range in age from two to adolescence, and a multitude of classes and activities are offered to meet the special needs of attendees. The school provides activities that improve academic performance, support positive behavior, promote self-care and independence, strengthen physical capacities, improve expression through speech therapy, and train students for vocations. 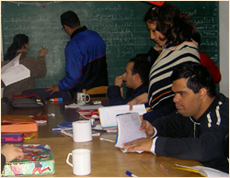 Students participate in special tournaments in Egypt and internationally.